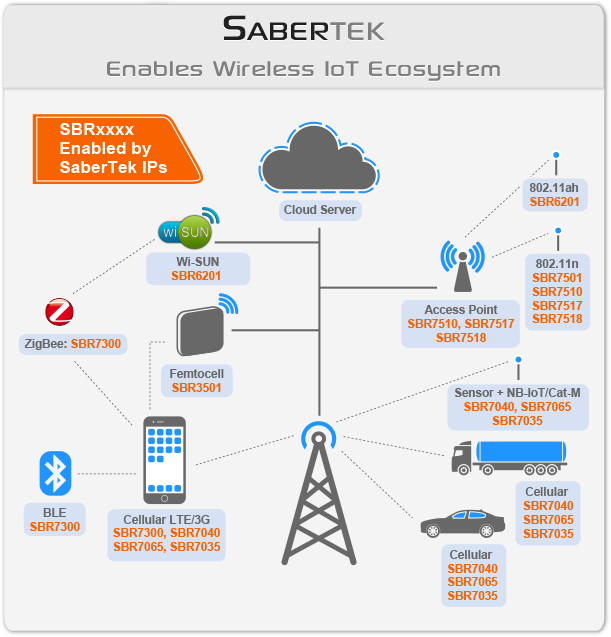 SaberTek Inc. provides wireless transceiver IPs for wireless IoT applications. We provide unique IP portfolio with ultra-low-power and low-silicon-area transceiver for IoT and wearable applications. Various standards address different applications of wireless IoT. SaberTek uniquely provides IPs enabling all aspects of wireless IoT. SaberTek NB-IoT/Cat-M1 transceiver IPs (4'th generation LTE IP) enables cellular wireless IoT at a fraction of cost and power consumption compare to the existing LTE solutions. SaberTek Wi-Fi (4th generation Wi-Fi IP) and Bluetooth IP families enable the stationary applications were Wi-Fi gateways are available.